» Digital Billboards: Tear Them Down, or Wrap Them With Vinyl Ads? Digital Billboards: Tear Them Down, or Wrap Them With Vinyl Ads? The latest chapter of L.A.’s digital billboard saga opened this week with an announcement by CBS Outdoor that it intends to cover its now-dark digital billboard faces with vinyl ads. 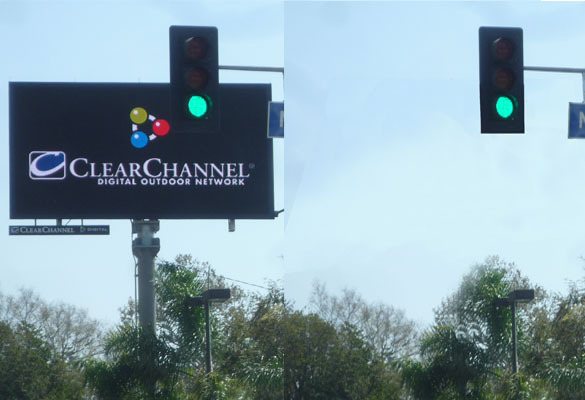 At the same time, the company whose lawsuit resulted in last month’s order to “pull the plug” on 99 digital billboards filed a new motion asking that CBS and Clear Channel be ordered to completely demolish those billboards. Superior Court Judge Terry Green today turned thumbs down on the idea of displaying vinyl ads on the digital billboards. He also set a July 16 hearing date on the motion by Summit Media, the company that successfully sued the city to overturn the 2006 lawsuit settlement agreement that allowed the conventional billboards to be converted to digital even though the city four years earlier had banned new billboards or alterations to existing billboards. The question to be argued at that hearing will be whether the billboards can revert to non-digital form, or whether the companies have lost the right to operate any kind of billboards at those 99 locations. Given the inherent value of the signs, that question is certain to be hotly argued and subject to further legal appeals if the judge rules in Summit Media’s favor. In its motion, Summit Media argues that because the court has ordered the digital conversion permits issued under the 2006 agreement to be voided, the 99 billboards now lack valid permits and are illegal under the 2002 ban on new billboards. The motion also cites sections of city ordinance that allowed billboards to remain after the 2002 ban as non-conforming uses only if no alterations or modifications are made to the signs. The billboard companies are obviously taking a serious financial hit because of the inoperative billboards, and that fact is likely to mean further pressure on the City Council to pass legislation allowing digital billboards, if not in their current locations then elsewhere in the city. To date, however, a huge lobbying and PR effort mounted primarily by Clear Channel on behalf of digital billboards hasn’t produced anything like a groundswell of political support. And a billboard “Visioning” group put together by the City Planning Dept. and composed of industry representatives and community activists resulted in little consensus on the issue of digital signage. The political picture is less than clear, however, since eight of the fifteen city council seats and the mayor’s office will change hands on July 1.